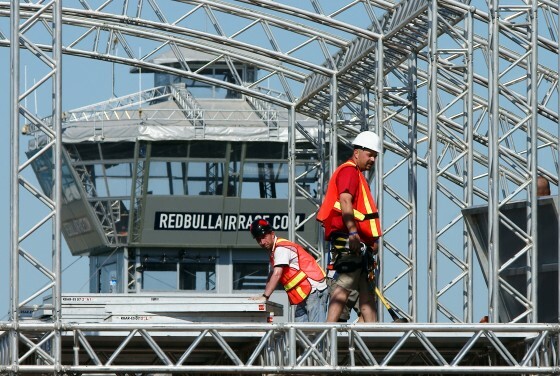 The Red Bull Air Races are almost here, but they won’t be ready to soar until thousands of crates of supplies and materials are assembled into buildings, stages and pylons along Windsor’s riverfront. 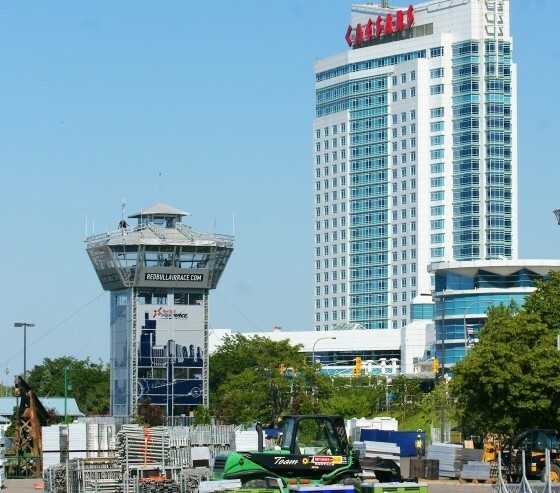 Truckloads of supplies arrived last week, shipped to Canada from Rio de Janeiro, Brazil after the previous Red Bull race concluded on May 9th, and ten days of setup began both at Windsor Airport and Downtown. Work crews promptly erected a barrier around the Riverfront complex, and set out to assemble the Riverfront control tower. Several mountings for LED television screens are dotting Dieppe Park. 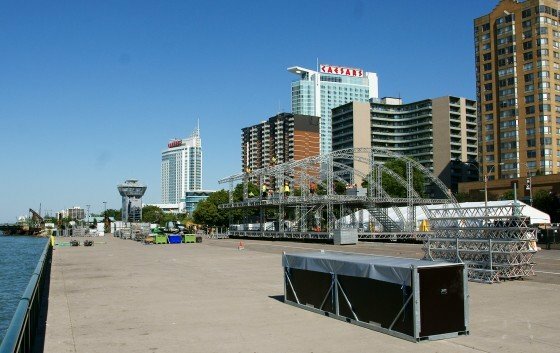 Crews assembled the media and VIP complex, located hundreds of washrooms within the perimeter and prepared high voltage generators to power the scene of this weekend’s event. In the river, race pylon platforms have been anchored in place: official pilot training starts Thursday. 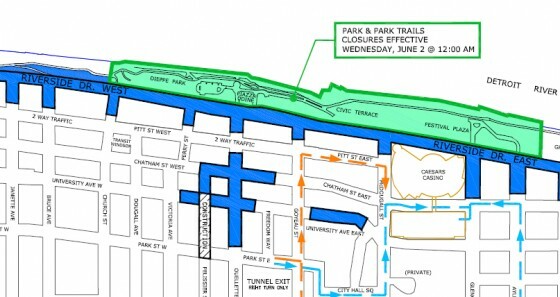 The City of Windsor wants you to know about a number of road detours and adjustments to downtown. Pitt Street is the only East-West thoroughfare that will be open north of Wyandotte Street, between Caron St. and with a detour to Chatham Street until Aylmer Avenue. The Downtown Windsor Business Improvement Association is closing a number of streets and areas and will be featuring live music on stages on Chatham, in front of the Capitol Theatre and at Park and Ouellette. Transit Windsor will provide free Shuttle Service to and from Downtown on Saturday and Sunday (9am-6pm) from Devonshire Mall. Tickets are still available for the closed off areas on Red Bull’s Website.